Chord Melody is the art of playing chords and melody at the same time. 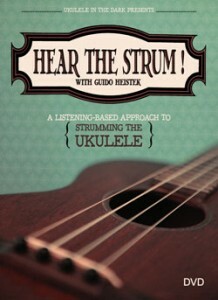 It is a solo ukulele technique that allows you to play beautiful and complete song arrangements on your own. This book will show you how to do it, step by step. 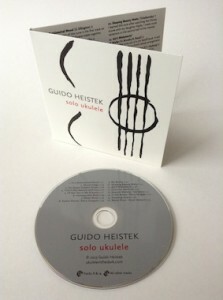 Two versions are provided of each arrangement in the book: one sparse and beginner-friendly, and another more technically challenging for the more advanced player. Each arrangement works equally well on high-G or low-G instruments. Links to online video demos and detailed performance notes are provided. 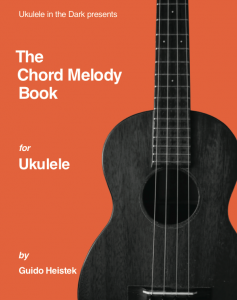 The flexible and innovative layout also features the chords, lyrics and melody; so you can strum and sing the song, or pick the melody on its own, before you embark on learning the chord melody arrangement. 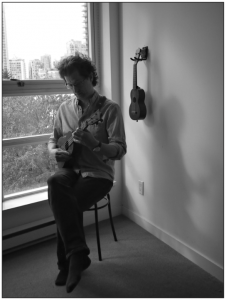 Everything you need for your solo ukulele adventure! The book is 68 pages, spiral bound on nice thick stock for minimum show-through. Dimensions are 8 3/4″ by 11 3/4″, just a quarter inch smaller than 9″ x 12″. Here is a playlist of all the 20 video song demos for the book. You can browse through the videos and hear what you will learn! Remember, there are two versions of each song.